For those that follow this site, you probably know that I have recently taken up golf as a hobby. Why would anyone want to play golf you may be asking? Isn’t golf a good-old-boy activity? A carryback to the days of elite clubs that excluded everyone but rich white guys? There’s no disputing that golf traces its origins to that era. And there are probably still plenty of folks who think that way. But with Tiger Woods’ popularity, the game of golf changed. Television revenue, equipment sales, and number of players all increased. Things were good for a while. And then came Tiger’s downfall. And now golf again finds itself teetering on the verge of becoming a fringe sport. As background, I never played a single round of golf until after college. I played lots of sports growing up – football, basketball, baseball, soccer, hockey, track, but no golf. I never even thought much about golf until I started working. When I entered the workforce in the mid 90’s, golf was still prevalent in business. This was especially the case in my different jobs in the finance industry. And the degree of golf within my corporate roles was pretty much determined by those in charge. When my boss was a big golfer, if I wanted some away from the office time, it was easiest to grab on the golf course. When clients or vendors liked to play, again it was a good way to spend some quality time away from the office. Over the past 6 or 8 years, as the popularity of golf as a sport has waned, so has business golf. And that’s unfortunate. If you haven’t experienced business golf, you’re missing out. It’s a relatively low impact way to connect with people in a setting different from the normal office environment. But to use golf as an effective business tool, you need to learn the game. Golf is not an activity that you can just go out and play. It requires practice otherwise expect yourself to be hacking up the course, missing the ball completely, and having a pretty miserable time. And that is the problem – at least for me. Where and how do I learn to play golf? 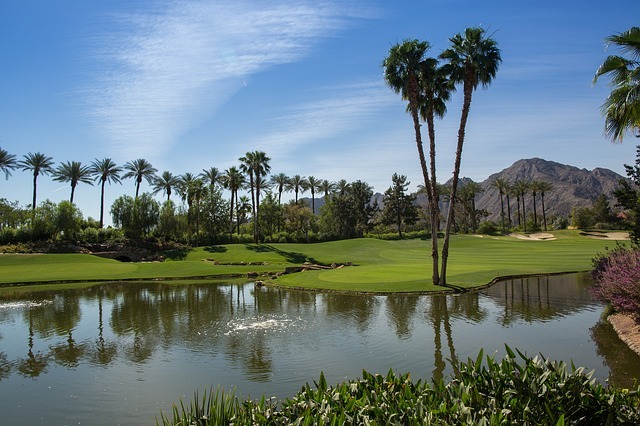 As to where to play, there are three options – private courses (i.e., country club), resort courses, and public courses. The private golf course is a unique experience. A number of years ago, we joined a traditional, old money, member-owned private club. We joined as social members, but could still play golf for an extra fee. To be honest, I am always a little intimidated on the golf course. As a novice player, I shank the ball off the side. I top the ball and it only rolls a few feet. I hit behind the ball launching big chunks of turf into the air. And, I sometimes completely miss everything. At private courses, my anxiety gets even worse. Everyone on the course seems to know exactly what they’re doing. Most of them play regularly, and at least at the club we belonged to, the members had an attitude and an arrogance about them. And the first time I played the course, my fears were realized. I got reprimanded by the golf pro for letting my 12 year old child drive the golf cart. Apparently, the infraction was magnified because he drove the cart in front of other members. Honestly, I didn’t even think that he wouldn’t be allowed to drive a cart. In any event, I’m not sure it deserved getting barked at by a guy who came running across the course. But despite this indignity, when I decided to learn the game, I approached the club about converting my social membership into a full golf membership. But apparently, when I had joined as a social member, I had received a discount. So in order to convert to full membership, not only would my dues double, but they wanted a substantial initiation fee that included the discounted portion of my social membership. They’ve been losing full golf members for years, so I tried appealing to their business side. But they refused to budge. At the same time, I called another club (it’s not as nice but it’s 5 minutes from my house, unlike the first club which was 30 minutes away). This club immediately jumped on the new member opportunity. The General Manager called to tout the benefits and essentially I could join for just slightly more than the cost of a social membership at the other club and with no initiation fee. I pulled the trigger and signed up. Then I terminated membership at my other club. Interestingly, they never even bothered to ask why I was quitting. The moral of this story is that private clubs can be great for playing golf. They typically have good instructors and the courses are well maintained. But they are expensive and at least for me, they add stress to my learning the game. If you like the country club lifestyle (swimming, tennis, social events, etc. ), and will be playing often, joining a club can be good. Otherwise, it’s a pretty expensive option. The resort golf course is another option. Resort courses are typically attached to destination hotels. The benefit of a resort course is that they typically have a wider range of player. Everyone from the novice to the experienced player. The courses are well-maintained and they also have good instructors. The problem is again the cost. Whereas in a private club, you typically pay a monthly fee (and maybe an intiation fee) and can play as much as you want, at a resort course, you pay greens fees each time. If you don’t play too often, the resort course is a great option. But if you want to really learn the game, you need to play often, and that means learning to play at a resort course will be pretty expensive. The public golf course is the final option. And while the quality of public courses will vary widely, even in the same city, the benefits are obvious – cost. Playing fees at public courses will be the lowest of the three options. The other benefit of public courses is the clientele. You may have the occasional flip flops and tank top player, but you won’t have to put up with the golf snob. Whatever option you choose, find a course you like to play, with people you enjoy being around, and an instructor that helps you improve. SAFETY: The best place to stand when someone else is hitting the ball is at least 10 feet away, further from the hole, and within their line of sight to the side. NEVER stand closer to the hole than the person hitting. COURTESY: Do not speak, make noise, move, or do anything distracting when another player is hitting the ball. You should not run, goof off, or speak loudly on the course. Replace or sand divots and other damage. Be respectful of other players and the course. It’s a privilege to play golf. ORDER OF PLAY: From the tee, the player with the lowest score on the prior hole goes first (has honors). If players tied the prior hole, their order stays the same as the prior hole. On the fairway, the player furthest from the hole ALWAYS plays first. ON THE GREEN: Leave the cart and any extra clubs behind the green on the way to the next tee. Never leave anything in front of the green. Do not drive the cart, push cart, or place your bag on the green. Mark your ball on the green with a small coin. Player furthest from the hole putts first. Do not step on someone else’s putting line or stand along the extension of the line. After you putt, if you can easily knock your ball into the hole, go ahead and putt out, otherwise mark your ball again and let the players further from the hole putt. When retrieving your ball from the hole, do not step within 1 foot of the cup (so you don’t damage the edge). If the flag has been removed, the first player to putt out should grab the flag and replace it after all players have finished putting. SAND BUNKERS: Before entering a bunker, grab a rake and carry into the bunker dropping it about 5 feet from your ball. Enter bunker at the shallowest point from behind (not green side) closest to your ball. Do not allow your club to touch the sand until you begin your downswing otherwise it’s a two stroke penalty. After your shot, rake your footprints and smooth the sand as you back out of the bunker the same way you entered. SEARCH TIME: Limit of two minutes to look for your lost ball. Other players keep going. Bring two or three clubs with you while you look. If ball is lost, proceed under Rule 7. CONCEDED PUTTS: Short putts may be conceded with your playing partners’ consent. PICK UP: If you are struggling and having a terrible hole, pick up your ball, record the maximum score under Rule 6, and move on to the next hole. Golf should be fun not a struggle. Be ready to play when it’s your turn whether on the tee, fairway, or green. Most time is lost from green to the following tee. Take only one practice swing. More than that doesn’t do any good. After you hit, watch your ball until it stops rolling, find a landmark along the line, walk directly to your ball, and be ready to hit your next shot when you get there. After all players finish a hole, walk off the green, go directly to the next tee, and tee off without delay. All players carry their own score card and pencil. Record your score while walking to next tee. Golf is a great game that you can play at any age. You can play with your friends, your spouse, your kids, or with business associates and because of the handicapping system, everyone can be competitive regardless of skill level. Get out and start playing today. Do you think there is any future for golf as a business tool? Do you play? Do you want to learn? Or do you feel golf is best left to retirees (and not the FIRE ones)? I like you have a bit of anxiety with golf. Although I love to play I am not the greatest player (e.g. topping the ball). I actually want to take more lessons to play although for me it seems to find others who want to play around my age. I think most think of it as that old boys club sport, but I love it. Keep hacking. Love the blog. Golf is a great lifetime sport. When I was in corporate finance roles, I got to play quite a bit, but I was horrible. Now that my game is decent, I don’t get as many opportunities to play. But I still love it (even with the anxiety).